Thermal baths, hydrotherapy pool, swimming pools, children's pool, steam room, sauna, solarium, sun garden and various other health and beauty treatments await you at the resort's spa, with both indoor and outdoor facilities. Indulge yourself free of guilt to feel revitalized and rejuvenated. A gym, with an aerobics studio, yoga and other health and fitness regimes will also be available to be enjoyed with or without the help of personal fitness instructors. Hungary is famous for its thermal baths, the effects of the thermal water rushing up in Hungary are well known across Europe and the world. 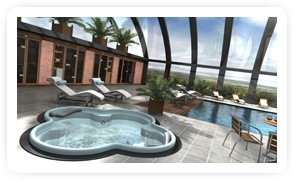 The residents and the visitors of the Budapest Gate Country Club will enjoy a unique experience by using the services of the spa and wellness centre. Thermal baths, hydrotherapy pool, swimming pools, steam rooms, sauna and solarium await guests at the spa resort with health and beauty services. A gym, an aerobics studio and a yoga centre will also be available, where you can retain the help of a personal fitness instructor.